It's kind of funny how I've never talked about Golden Rose here whereas their lipsticks are my favorite lipsticks ever. I think I've said I would show you my haul from Cookie's Makeup and I think I will be showing you my purchases beginning of March. Indeed, the new Golden Rose Longlasting Liquid Matte Lipsticks will be released at Cookie's Makeup around the beginning of next month and I would like to show you all of my new makeup from the brand when I'm done breaking the bank there. 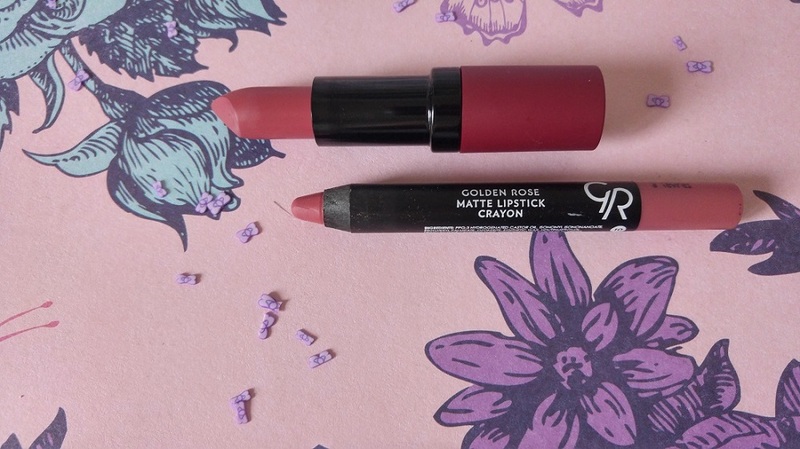 Today, I want to show you two of my favorite matte lipsticks from the brand Golden Rose : the Velvet Matte Lipstick in 02 and the jumbo Matte Lipstick Crayon in 10. Why write about those two when I could review all my Velvet Matte Lipsticks in one article and review all my Matte Lipstick Crayon in another ? It's simple : they practically are the same color. I have read some blogs where girls lament the fact that Golden Rose offers the same lipstick colors in two lipstick versions. For instance, Makeup Arena has written a very precise article about both formats with all the swatches. It may not be in English but you can understand everything with the pictures she's taken. Her article is partially the reason why I've chosen to write my article(s). 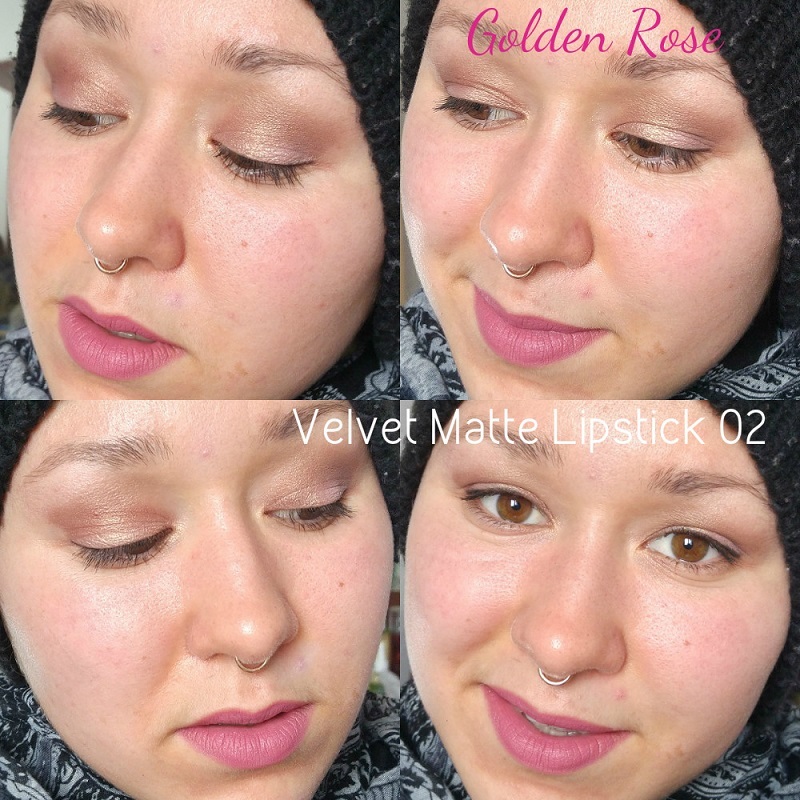 The Golden Rose Velvet Matte Lipsticks all have the same matte burgundy and golden packaging with a black ring in the middle. They are made in Turkey and contain 4.2g of lipstick. They retail for €3.90 at Cookie's Makeup. 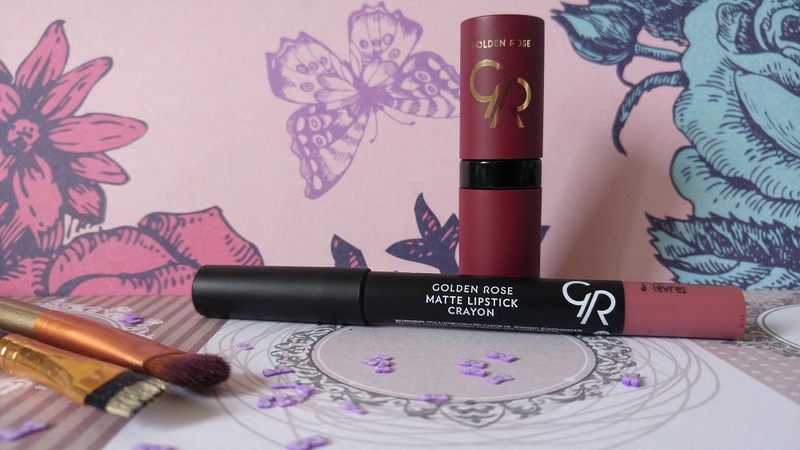 The Golden Rose Matte Lipstick Crayon all have the same black and white packaging and the bottom of the pencil indicates the color of the lipstick. I like that, given that I put them all together in a pot : they're easier to find when I need one in particular. They are also made in Turkey and contain 3.5g of lipstick. They cost €3.50 apiece at Cookie's Makeup. Both can be kept up to 18 months after you've first opened them according to the packaging. I've given you the Cookie's Makeup price, though you can also buy the Velvet Matte range on BeautyCosmetic, a Bulgarian website that you can translate in English and in German. 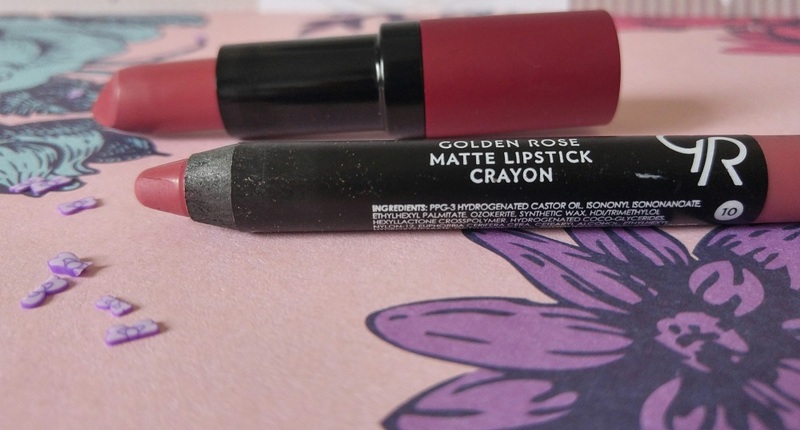 There, they cost about €2.50 and some other Golden Rose lipstick ranges (not the Matte Lipstick Crayon though. I have bought oh so many lipsticks on this website, I promise I'll talk about it soon !). In the picture below, I have swatched both lipsticks. 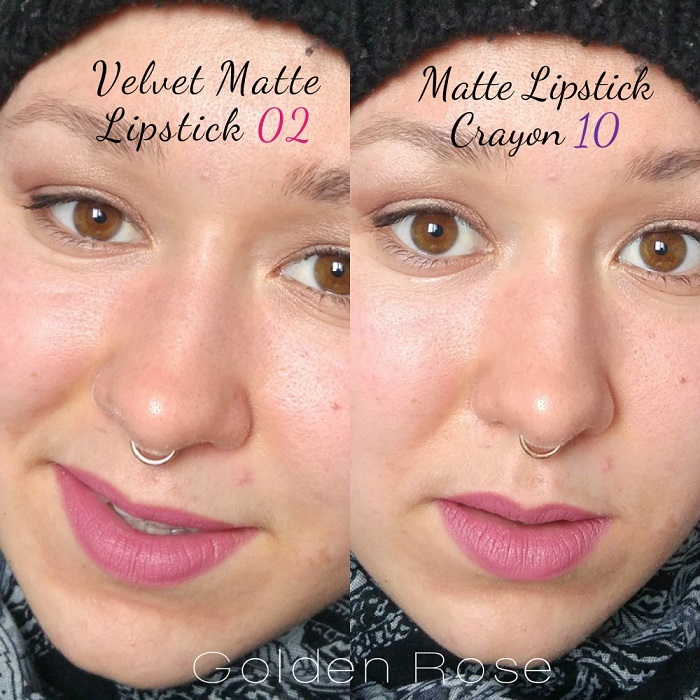 Although the colors are really close to each other, the Velvet Matte Lipstick 02 is a tad warmer whereas the Matte Lipstick Crayon 10 is a teeny bit cooler-toned, with bluer undertones. The only very noticeable difference lies in the texture of those two Golden Rose lipsticks. Let me assure you that while I naturally have dry lips, I can wear these without a lipbalm underneath. I would advise you to use a lipscrub sometimes though because these hold to the dry patches of the lips ! 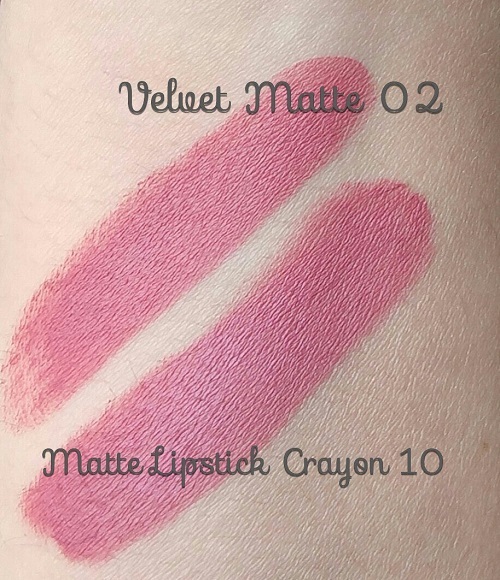 The Velvet Matte Lipstick is a bit "drier" when you apply it than the Matte Lipstick Crayon that is creamier. In any case, the application is really easy be it with one or the other ! I have been surprised to find one or two bloggers who thought the Velvet Matte Lipsticks are drying O.O. I do love their vanilla scent when I apply them and how comfortable they are on my lips ! Maybe you can notice the difference in the pic below, the Matte Lipstick Crayon 10 is a tad cooler-toned than the lipstick. I have photographed the lipsticks I have not used yet, I have indeed two lipsticks unopened and unused in case I finish one ! Antique cool-toned pinks, my lips but better lipsticks for less than €4 ? Oh yes ! How can put it ? I am truly in love with those lipsticks. They are really affordable and they last for such a long time ! I have noticed that using a lipbalm underneath a lipstick makes it more prone to smudging so I use them without one. As per usual, oil-based meals will kill the look, other than that you're good to go ! I will prepare more Golden Rose battles and lipstick reviews soon ! It's important to me that I participate in making this brand famous as its products are so cheap and so good..! 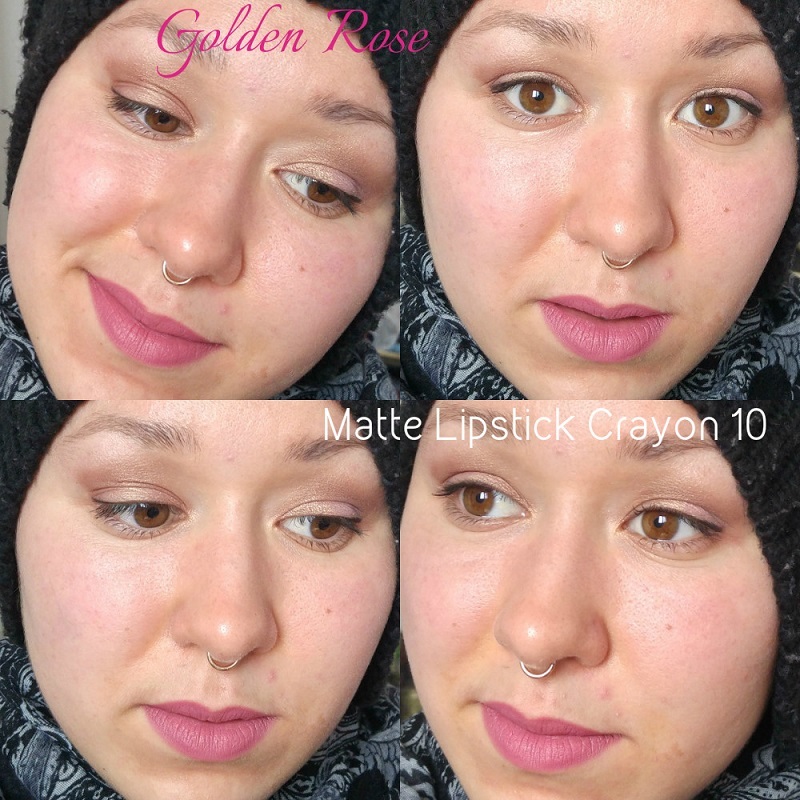 Have you ever used Golden Rose makeup ? What products would you advise I try out ?